Since our start in New York in 2011, Joyride Coffee has expanded to 4 coffee-loving markets over the last 6 years. It certainly has taken the Joyride team a lot of caffeine, hustle, and grit to get to where they we are, and we’ve loved every minute of the ride! Currently, Joyride serves New York, San Francisco, Boston, Los Angeles… but our newest expansion makes our amazing cold brews, office coffee and Craft on Draft beverages available for the first time to San Diego! With this new San Diego expansion well underway, we decided to sit down with regional manager, Anders Crabo, to learn a little more about what's going on behind the scenes! Anders is a true embodiment of hustle and grit, two aspects we always look for in members of the Joyride squad. Anders’ Joyride story begins August of 2013 in New York where he was brought onboard to install brewers, kegerators, and do sales. Being handy with tools and with a love of coffee, Anders seemed best suited for the role! In his first year, he went from being a newly on-boarded tech to managing the equipment side of operations, and trained as Joyride’s first full-time tech in New York in Spring of 2014. Since then, Anders has opened up the Los Angeles market, become Joyride’s VP of Tech and is now expanding to San Diego to open our reach to all of Southern California. MK: Why expansion to San Diego? AC: Joyride’s expansion to San Diego was really to capture new business and open up opportunities that expanding territory allows. San Diego seems to be an emerging market for cold brew, kombucha, and beverage in general, so the on-trend culture really made sense for Joyride. For us it felt like getting there sooner rather than later was important and we wanted to be among the first to capture that amazing coffee market. MK: Have there been any challenges? AC: San Diego is a a very locally-driven market. The city is a very beautiful place and San Diegans know it! San Diego loves San Diego for good reason and in expanding to the area, we are adding local players to our menu to double down on our local focus. As it stands, our menu has a nice sprinkling of California offerings, New York offerings and a few others. We currently have just one partner from San Diego proper, Dark Horse Coffee Roasters, and we are looking to add to our offerings in the coming months. 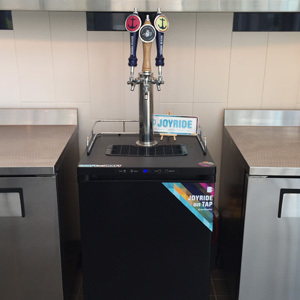 A Joyride Craft on Draft setup in San Diego! MK: You’ve worked in the New York, San Francisco, and Los Angeles Joyride branches, so you really have a unique perspective on each market. How do they all compare, and where does San Diego fit in? AC: I don’t think I know enough about San Diego (yet) to really compare it to San Francisco, Los Angeles, and New York, but thus far the market is taking well to our portfolio and services and the burgeoning tech startup tech scene is definitely hopping onboard, so that's a really great sign. MK: What’s your favorite food spot in San Diego? AC: (Laughing) Probably my friend Gator’s house. Editors note: Definitely try Hodad's in San Diego for a burger that can't be beat! MK: What seems to be popular in terms of products for San Diego? AC: Just going over our customers in my head, most of our customers are ordering both cold brew and kombucha. That’s what we like to see and where we think draft is heading, hence our focus on our trademarked "Craft on Draft" program. It’s hard for me to pick one product over another – kombucha, cold brew, and tea – but cold brew and kombucha are definitely popular! MK: What do you hope to accomplish within a year of opening? AC: We would really love to do business with Qualcomm, but there really are a lot of cool companies in the area. Working with big, interesting, innovative companies in the area like Illumina, Petco Park, GoPro to name a few would be a lot of fun. We are hoping to secure at least one or two fast casual chains with locations in San Diego, Orange County, Los Angeles, and perhaps even San Francisco. In the future, I see us building distribution from Napa Valley and Santa Rosa/Petaluma above San Francisco all the way down to the border so one day we can call it "Joyride California" as a unified whole. That would be really exciting! All this talk of cold brew and kombucha making you thirsty? Looking to have an awesome local San Diego roaster like Dark Horse Coffee in your office every day? Joyride is here to help! Whether it's cold brew on tap for your office, or iced tea and kombucha on tap for your cafe, we're the industry experts ready to help you build a world-class beverage program. Contact us to schedule a complimentary tasting of Joyride's Southern California products! Upgrade Your Coffee Program, Today!